The life of a dance comes from the artist’s touch and training. These two elements determine whether or not the dancer will leave a legacy of pride, honor, and distinction. These are the two elements that have made Effie Nañas one of the country’s ballet luminaries. Effie began her strides early in life. The Classical Ballet Academy in Saigon first bore witness to her talent at the age of five. Richard Maitland’s International Dance Theater in New Delhi subsequently saw the developing potential of this young student. It was also during these years that she learned the Bharata Natyam and other forms of classical Indian dances from the School of Indian Classical Dance. Aside from this, she had the honor of receiving private instruction from a premier Kathak dance master in Pakistan. She moved with her family to the Philippines in 1964 where she continued her training under Anita Kane. Shortly after this, she was welcomed into the Hariraya Dance company. Her versatility in this prestigious company was highly influenced by her mentors which include Remedios de Oteyza, Heather Llodra and Sulamith Messerer. 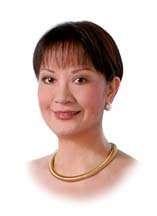 In 1973, she joined the CCP Dance company (now Ballet Philippines) as principal dancer. It was in the CCP Dance Company where Effie pursued her craft and mastery of classical ballet. Her thirst for dance was not to be quenched. Despite her tortuous schedule, she still pursued further training in modern and contemporary dance with CCP Dance Company residents and visiting foreign ballet masters. Effie's wealth in talent and experience had been enriched by many career influences: Alice Reyes, Eddie Elejar, Tony Llacer, Edgar Valdez, Norman Walker, Rochelle Zide Booth, Ivan Nagy, Garth Welch, Jan Stripling, Miro Zolan, Alfred Rodriguez, Gerard Sibbritt, Robin Haig, Jean Deroc, Armin Wild, William Morgan and Alexander Ursuliak. As such, Effie's mastery of her craft has won her accolades and plum roles in many major productions. She danced the major roles in many classics such as La Bayadere, Les Sylphides, Sleeping Beauty, Swan Lake, Don Quixote, Nutcracker, and Giselle. Indeed her grasp and delivery awed audiences, be it in classic, neoclassic, modern ballet, rock or contemporary dance. She has done too a number of choreographic works and restagings which have awed both spectators and critics. Among them are Snow White, Parvati, Andaluza, Images, Swan Lake, Maria Makiling, Les Sylphides, Swan Lake, and Variations D,Amour, all for Ballet Philippines. Effie also received scholarship grants from the French Ministry of Foreign Affairs and the International Theater Institute of Berlin, and was exposed to the Paris Opera Ballet, Stuttgart Ballet, Munich State Opera Ballet, Frankfurt Ballet, and the Hamburg Ballet. She has also done observational studies all over the world in other major dance companies such as the Royal Danish Ballet, Australian Ballet, The Netherlands Dance Theatre, American Ballet Theater, New York City Ballet, Alvin Ailey American Ballet, National Ballet of Canada, and Les Grands Ballet Canadiens among others. And yet, with all the success she has achieved, Effie believes that nothing compares to the artist's molding of young talent. And so, the artist continues her craft, not as dancer, but as mentor. She uses all these knowledge gained to foster the growth of her students. The Effie Nañas School of Classical Ballet, has trained a great many young dancers who wish to experience the discipline and training that have made Effie Nañas one of the modern gurus in the Philippine ballet scene. In this way, her touch and training will be like a torch that will continue to burn and live in the talent of future generations in this universal art we call dance. The Effie Nañas Ballet has truly evolved through the years into becoming a reputable ballet institution. Proving to be “Your Foundation of Excellence” since 1965, it has produced a large number of professional dancers and thus has, for more than forty years, continued to offer disciplined training and excellence. Then named the Effie Nañas DanCentre and Effie Nañas School of Classical Ballet (ENSCB), its first branch was at the Phil-Am Homes clubhouse, which expanded to campuses (Ateneo and St. Bridget), and more notably, in the SM Malls (Cubao, North EDSA, and Megamall). In January of 1998 the school became the resident ballet academy of the Capezio Center at the Shangri-la Plaza Mall, which has become its home ever since. ENSCB had also been the house dance institution of the Aguinaldo Academy of the Arts in Cam Aguinaldo, Quezon City since August of 2001. Three years later in June of 2004, the school reached an important milestone when it acquired ownership pf the studio in Shangri-la and was then renamed the Effie Nañas DanCentre. The school’s year-round activities aim to develop the talents of its students in their continued quest for honors and distinction. It is definitely a schedule that is both demanding and fun, requiring dedication and passion for the art of dance. During the summer months, enrollees old and new are welcomed once again. Intensive preparations start for the grand recital. The anticipation builds up as the students get ready for a Christmas and holiday recital held every December at the Shangri-la Plaza Grand Atrium. As a member of the Association of Ballet Academies of the Philippines (ABAP) since 1995, the students have also participated in the association’s annual school members’ joint concerts called “Danseries”. The grand recital held every November serves to highlight the students’ hard work and determination, under colorful stage lights and in front of a proud audience. Aside from these activities, the school also exposes its students to opportunities that lie beyond the comforts of the studio. On occasion, the ballerinas have been invited to train and perform alongside dancers from prestigious ballet companies such as Ballet Philippines. In fact, several graduates of the school have gone on to become members of this prominent and celebrated dance institution. Some students were also fortunate enough to cross Philippine borders and pursue international projects such as those in Chicago and San Francisco, and lastly in Australian Ballet School. Among the many proud moments of the school was at the renowned Jackson Mississippi International Ballet Competition where some students pursued their life-long dreams of showcasing their talents. Proof positive of these notable achievements is two years of taking the Australian Conservatoire of Ballet examinations, wherein the students’ efforts produced truly remarkable results. In addition, a number of students have also participated in master classes given by visiting ballet teacher Tina Santos, Assistant Professor of Ballet at the New World School of the Arts in Florida, USA, thus, further enriching their abilities in dance and beyond. The Effie Nañas Ballet has oftentimes been known for its rigid standard, the long practice sessions, and demanding schedule. And yet, what is commonly left unsaid make up the lasting legacy of the school to all who enter through its doors. Students are infused with such essential traits as dedication, discipline, skill, artistry, and above all, a love for dance. The creative atmosphere and dynamic environment it offers is manifested through the inspired eyes and smiles of its students, who are made ready to face the world beyond the four walls of the studio. It is for this and much more that Effie Nañas provides quality dance education which will have laid the spirit of excellence for all of its students’ lives.